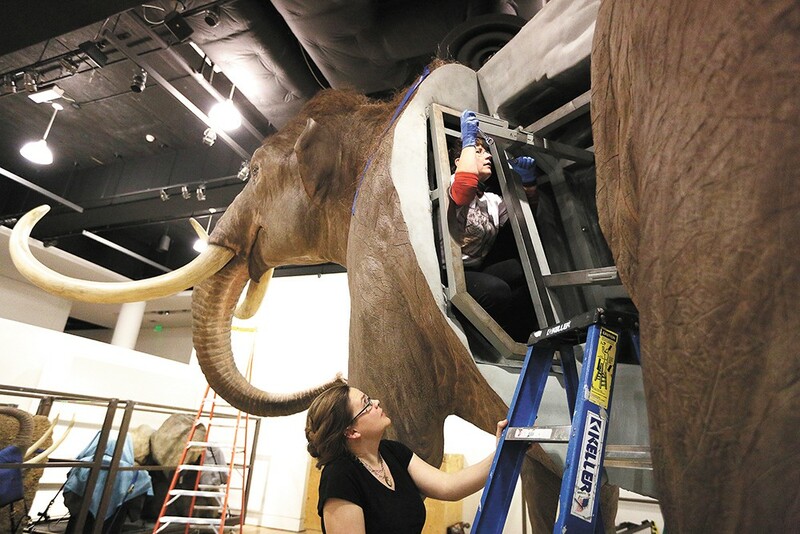 Museum staff assemble a life-size model of the Columbian mammoth. Ghosts of the ancient past loom over the exhibit halls of the Northwest Museum of Arts and Culture, casting their massive shadows across the concrete floor. Standing on hind legs, a roaring bear towers 12 feet — its actual size — above visitors as they enter Mammoths and Mastodons: Titans of the Ice Age, the newly arrived blockbuster exhibit from Chicago's Field Museum of Natural History, here through May 7. Once inside the MAC's cavernous galleries, visitors' skin might prickle, just as our human ancestors' would have, as they sense being watched from above. A snarling smilodon — perhaps better known as the saber-toothed cat — stealthily stalks its prey from atop a rocky perch. 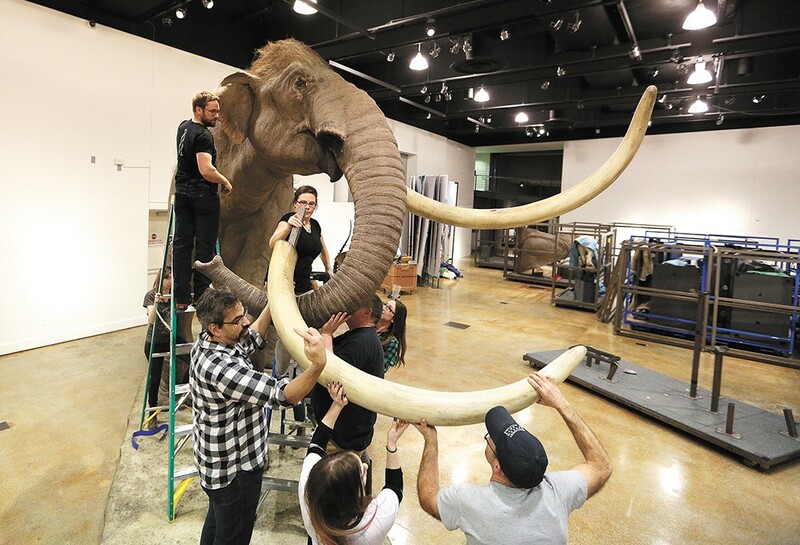 By sheer size, though, the king of these Ice Age beasts is the lumbering Columbian mammoth, whose footfalls and trumpet calls reverberated across the Inland Northwest's fields and forests millions to tens of thousands of years ago. Guests can marvel at its massiveness as they stand beneath a fully fleshed-out, to-scale model, one of many exhibit centerpieces. One of the largest traveling exhibits, at 8,500 square feet, to ever come to the MAC, Titans of the Ice Age brings global natural history of the Pleistocene era full circle as it highlights how major fossil discoveries from around the world are connected to finds right here in the Inland Northwest. The species’ bones were first discovered in the Inland Northwest. Columbian mammoth bones were first discovered south of Spokane by a family of homesteaders, the Coplens, in the late 1870s. Fittingly, those original specimens — the first ever to be mounted into a full skeletal specimen — have been permanently housed at the Field Museum for more than 100 years. It's very easy to tag it all back here; just about everything," he continues. "There are in the hundreds of mammoths found in Eastern Washington, and each is a whole separate story, and the quality of each bone is different." Towering beasts and all, Titans of the Ice Age takes visitors of all ages on a highly interactive journey starting millions of years ago, when the early ancestors of Ice Age megafauna roamed the world, that ends with the curious extinction of giant bears, saber-tooths, mammoths and their ilk, a milestone scientists now know barely overlaps early humans. Most of the hundreds of fossilized specimens and cast replicas in the exhibit come from Ice Age archaeological sites all over the world. On display just for its Spokane stop, Titans also features several fossils discovered around the Northwest, says director of museum experience John Muredo-Burich. This includes a Columbian mammoth rib from the Coplens' farm outside of Latah, Washington, that's never been publicly shown. The most remarkable highlight of all, perhaps, is a 40,000-year-old baby mammoth found in a state of near-perfect preservation, having been encased in the Siberian permafrost until her discovery by reindeer herders in 2007. "Lyuba," as she's called, is thought to have died when she was 1 to 2 months old after suffocating in a mud bog; she is the most complete mammoth specimen in the world. While Lyuba has been displayed at other showings of Titans, the exhibit's stop at the MAC features a detailed model recreation of her fragile remains. "With the culmination of artifacts in this show locally and internationally, this is probably a one-time event that might not happen again for at least another 30 to 40 years," says Moredo-Burich. Another part of the construction job. Because of its size (requiring 11 semi-trucks to ship) and subsequent expenses ($400,000) for the MAC to rent Titans, admission is an additional $5 per person. 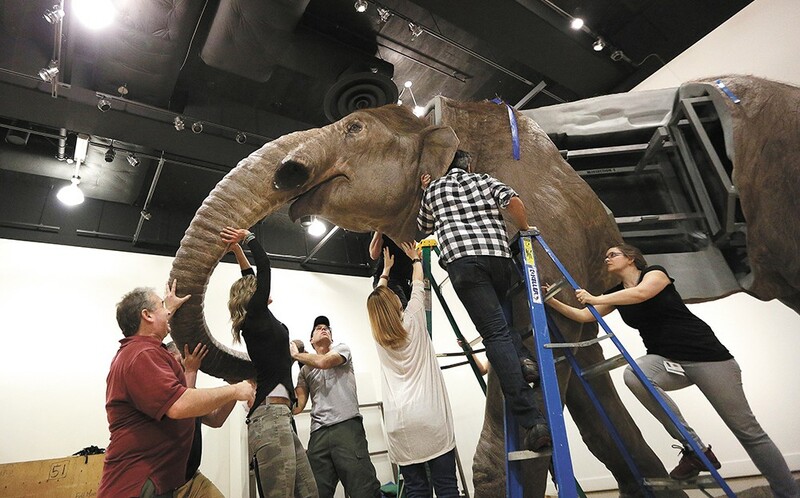 Museum staff, however, expect the exhibit to give attendance numbers a healthy boost; other host museums have seen upward of 100,000 visitors during the typical 100-day run, and Spokane will have the show for 122 days. Because of its huge popularity, Moredo-Burich booked Titans nearly two years ago. Spokane author Jack Nisbet retraces the tangled story of how area homesteaders first discovered mammoth bones in their fields in 1876. Ice Age Floods Institute president Gary Ford covers the floods' paths from Western Montana to the Pacific Ocean, highlighting landmarks carved out in their wake. Gonzaga biology professor John Orcutt shares his research on the iconic predator based on fossils found across the U.S. Learn more from CWU anthropology professor Pat Lubinski about this specimen discovered near Yakima during a road construction project in 2005. Titans curator and paleontology professor Daniel Fisher shares the story of Lyuba, the baby mammoth whose 40,000-year-old body was preserved in the permafrost of Siberia. Paleontologist Daniel Fisher and author Jack Nisbet lead a half-day trip to sites in the Palouse where Columbian mammoth fossils were discovered in the late 1870s.